After the confluence with Rock Creek, The Blackfoot River and The Bitterroot River meet The Clark Fork. The big lower river begins and the strong Rainbow Trout are king. The lower river fish eat dry flies with confidence and fight more like a steelhead than a trout. Spend three days fishing the Upper, Middle, and Lower river and you will feel that you have spent three days on three different rivers. Being such a diverse river, The Clark Fork River truly has something for everyone. Breath-taking scenery and arguably the best Salmonfly Hatch in the world are only two reasons why Rock Creek Fly Fishing should be on your hit list. The fast flowing, cold, and clean water of Rock Creek is home to more trout than you can cast a fly at. Rainbow Trout, Brown Trout, Cutthroat Trout, and the Native Bull Trout all call Rock Creek home. Dry fly fishing is how The Creek got its reputation, but during the fall the numerous brown trout in the creek love to attack streamers. Expert and beginner anglers alike will cherish a day spent on Rock Creek. If you can visit in June during the salmonfly hatch, there is no better way to fish than from a boat. Throwing huge dry flies to hungry fish in prolific numbers. That is why you fish Rock Creek. Wade fishing the creek after the spring runoff is very accessible along the road (take it slow, some Class V potholes develop on that one), and come prepared to navigate the well known “slickery” river bottom. The Bighorn Sheep, Bull Moose, Bald Eagles, Salmonflies, and more trout that you have ever seen come together for a perfect fishing day in Montana. It all sounds good on paper, but you really just have to come see for yourself. 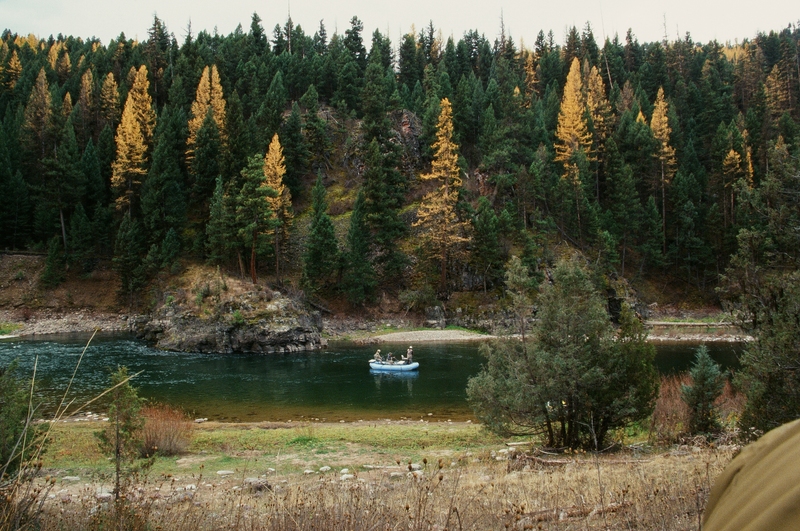 When Montana fly fishing comes to mind most people imagine The Blackfoot River. This iconic river is what a trout anglers dreams are made of. Deep pools, boulder gardens, and staggering cliff faces make up one of the most beautiful river settings in the country. The Blackfoot River is home to pristine populations of Westslope Cutthroat Trout, Native Bull Trout, as well as healthy Rainbow Trout and Brown Trout. The Blackfoot River is full of fish that love to eat dry flies. The big stoneflies are the big meal on The Blackfoot. Salmonflies and Golden Stones are a feast for these eager Cutthroats. Big fluffy dry flies are the summer ticket. No small flies here. Blackfoot River Fly Fishing and a River Runs Through It…what else can be said. The strong and healthy Rainbow and Brown trout love to go airborne during reel screamin’ runs. While Dry fly fishing is said to be The Missouri’s claim to fame, It can be extremely technical. The hatches and pods of trout rising to these bugs are a sight to see. Precise casts and perfect drifts are required to get these picky fish to eat. Nymphing is the favorite method among Missouri River Fly Fishing Guides for putting fish in the net.